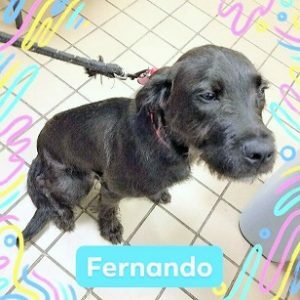 Friendly FERNANDO a Fine Fit for your Family? FERNANDO is a Lab mix pup with Schnauzer whiskers just about a year old. He moved to Last Hope from Hempstead Town Shelter. He embraces life..carries more than one toy at a time ….goes from person to person…leaning up against each for petting. but not enough time in his busy puppy schedule. This enthusiastic Lab/Schnauzer will respond well to training, consistency, love & attention. He needs someone to embrace him & teach him how to be the Best Dog He Can Be.